a 1939 conflict between Soviet and Japanese troops in the village of Nomonhan is thought to have led to the attack on Pearl Harbor? Coordinates: 47°43′49″N 118°35′24″E﻿ / ﻿47.73028°N 118.59°E﻿ / 47.73028; 118.59 The Battle of Khalkhyn Gol (Mongolian: Халхын голын байлдаан; Russian: бой на реке Халхин-Гол) was the decisive engagement of the undeclared Soviet–Japanese Border Wars fought between the Soviet Union, Mongolia and the Empire of Japan in 1939. The battle was named after the river Khalkhyn Gol, which passes through the battlefield. In Japan, the battle is known as the Nomonhan Incident (ノモンハン事件, Nomonhan jiken? ), after a nearby village on the border between Mongolia and Manchuria. The battle resulted in total defeat for the Japanese Sixth Army. The Battle of Khalkhyn Gol should not be confused with the conflict in 1945 when the Soviet Union declared war on Japan in support of the other Allies of World War II and launched its invasion of Manchuria. After the occupation of Manchuria, Japan turned its military interests to Soviet territories that bordered those areas. The first major Soviet-Japanese border incident, the Battle of Lake Khasan, happened in 1938 in Primorye. Clashes between Japanese and Soviet forces frequently occurred on the border of Manchuria. In 1939, Manchuria was a puppet state of Japan, known as Manchukuo. The Japanese maintained that the border between Manchukuo and the Mongolian People's Republic was the Khalkhyn Gol (English "Khalkha River") which flows into Lake Buir. In contrast, the Mongolians and their Soviet allies maintained that the border ran some 16 kilometres (10 miles) east of the river, just east of Nomonhan village. The principal occupying army of Manchukuo was the Kwantung Army of Japan, consisting of some of the best Japanese units in 1939. However, the western region of Manchukuo was garrisoned by the newly formed IJA 23d Division at Hailar, under General Michitarō Komatsubara and included several Manchukuoan army and border guard units. Soviet forces consisted of the 57th Special Corps, forward deployed from the Trans-Baikal Military District, responsible for the defense of the border between Siberia and Manchuria. The Mongolian troops mainly consisted of cavalry brigades and light artillery units, and proved to be effective and agile, but lacked armour and man power in sufficient numbers. In 1939, the Japanese Cabinet sent instructions to the Kwantung Army to strengthen and fortify Manchukuo's borders with Mongolia and the Soviet Union. Additionally, the Kwantung Army, which had long been stationed in Manchuria far from the Japanese home islands, had become largely autonomous and did not need to seek approval from the Japanese government before acting aggressively against the Soviets. The incident began on 11 May 1939. A Mongolian cavalry unit of some 70-90 men had entered the disputed area in search of grazing for their horses. On that day, Manchukuoan cavalry attacked the Mongolians and drove them back across the Khalkhin Gol. On the 13th, the Mongolian force returned in greater numbers and the Manchukoans were unable to dislodge them. On the 14th, Lt. Col. Yaozo Azuma led the reconnaissance regiment of 23rd Division, supported by the 64th Regiment of the same division, under Colonel Takemitsu Yamagata, into the territory and the Mongolians withdrew. However, Soviet and Mongolian troops returned to the disputed region and Azuma's force again moved to evict them. This time things turned out differently, as the Soviet-Mongolian forces surrounded Azuma's force on 28 May and destroyed it. The Azuma force suffered eight officers and 97 men killed and one officer and 33 men wounded, for 63% total casualties. The commander of the Soviet forces and the Far East Front was appointed Comandarm Grigori Shtern since May of 1938. Both sides began building up their forces in the area: soon Japan had 30,000 men in the theater. The Russians dispatched a new Corps commander, Comcor Georgy Zhukov, who arrived on June 5 and brought more motorized and armored forces (I Army Group) to the combat zone. Together with Zhukov arrived Comcor Yakov Smushkevich with his aviation unit. On 27 June, the Japanese launched an air attack. The Japanese 2nd Air Brigade struck the Soviet air base at Tamsak-Bulak in Mongolia. The Japanese won this engagement, destroying half as many Soviet planes as they lost, but the strike had been ordered by the Kwangtung Army without getting permission from Imperial Japanese Army headquarters in Tokyo. Tokyo promptly ordered the Japanese Army Air Force not to conduct any more strikes. Throughout June, there were continuing reports of Soviet and Mongolian activity on both sides of the river near Nomonhan, and small-scale attacks on isolated Manchukoan units. At the end of the month, the commander of the Japanese 23rd Division, Lt. Gen. Michitarō Komatsubara, was given permission to "expel the invaders". The Japanese plan was for a two-pronged assault. Three regiments plus part of a fourth, including three from the 23rd Division--the 71st and the 72nd Infantry Regiments, plus a battalion of the 64th Infantry Regiment--and the 26th Infantry Regiment under Colonel Shinichiro Sumi, "borrowed" from the 7th Division, would advance across the Khalkin Gol, destroy Communist forces on Baintsagan Hill on the west bank, then make a left turn and advance south to the Kawatama Bridge. The second prong of the attack would be the task of the Yasuoka Detachment, consisting of the 3rd and the 4th Tank Regiments, plus a part of the 64th Regiment, a battalion of the 28th infantry Regiment, detached from the 7th Division, 24th Engineer Regiment, and a battalion of the 13th Field Artillery Regiment, under overall command of Lieutenant General Yasuoka Masaomi. This force would attack Soviet troops on the east bank of the Khalkhyn Gol and north of the Holsten River. The two Japanese thrusts would meet in the Soviet rear and encircle them. The northern task force succeeded in crossing the Khalkhyn Gol, driving the Soviets from Baintsagan Hill, and advancing south along the west bank. However, Zhukov, perceiving the threat, launched a counterattack with 450 tanks and armored cars. The Russian armored force, despite being unsupported by infantry, attacked the Japanese on three sides and nearly encircled them. The Japanese force, further handicapped by having only one pontoon bridge across the river for supplies (most of its bridging personnel had been sent south to assist in the war in China), was forced to withdraw, recrossing the river on 5 July. Meanwhile, the Yasuoka Detachment (the southern task force) attacked on the night of 2 July, moving at night to avoid the Soviet artillery on the high ground of the river's west bank. A pitched battle ensued in which the Yasuoka Detachment lost over half its armor, but still could not break through the Soviet forces on the east bank and reach the Kawatama Bridge. After a Soviet counterattack on 9 July threw the battered, depleted Yasuoka Detachment back, it was dissolved and Yasuoka was relieved. The two armies continued to spar with each other over the next two weeks along a four-kilometer front running along the east bank of the Khalkhyn Gol to its junction with the Holsten River. Zhukov, whose army was 465 miles away from its base of supply, assembled a fleet of 2600 trucks to supply his troops, while the Japanese suffered severe supply problems due to a lack of similar motor transport. On 23 July, the Japanese launched another large-scale assault, sending the 64th and 72nd regiments against the Soviet forces defending the Kawatama Bridge. Japanese artillery units supported the attack with a massive barrage that consumed more than half of their ammunition stores over a period of two days. The attack made some progress but failed to break through Soviet lines and reach the bridge. The Japanese disengaged from the attack on 25 July due to mounting casualties and depleted artillery stores. They had suffered over five thousand casualties to this point but still had 75,000 men and several hundred planes facing the Communist forces. The battle drifted into stalemate. The Japanese regrouped, and planned a third major offensive against the Soviets for August 24. They never got the chance. Zhukov had been massing a major armored force in the form of three tank brigades (the 4th, 6th and 11th), and two mechanized brigades (7th and 8th, which were armoured car units with attached infantry support). This force was allocated to the Soviet left and right wings. In total, Zhukov had three rifle divisions, two tank divisions, two more tank brigades--in all, some 498 tanks--two motorized infantry divisions and an air wing of some 250 fighters and bombers to deploy against the Japanese. The Mongolians committed two cavalry divisions. The Kwantung Army, by contrast, mustered only two lightly-armed divisions at the point of attack, built around Lieutenant General Michitarō Komatsubara's 23rd Division whose headquarters had been at Hailar, capital of Hsingan, Manchu province, over 150 km from the site of the fighting. Their intelligence had also failed to detect the scale of the Soviet buildup or the scope of the attack Zhukov was planning. Zhukov decided it was time to break the stalemate. He deployed approximately 50,000 Soviet and Mongolian troops of the 57th Special Corps to defend the east bank of the Khalkhyn Gol, then crossed the river on 20 August to attack the elite Japanese forces with three infantry divisions, massed artillery, a tank brigade, and the best planes of the Soviet Air Force. Once the Japanese were pinned down by the advance of the Soviet center units, the armoured units swept around the flanks and attacked the Japanese in the rear, cutting lines of communication, overcoming desperate Japanese counterattacks (one Japanese officer drew his sword and led an attack on foot against Soviet tanks), and achieving a classic double envelopment. When the two wings of Zhukov's attack linked up at Nomonhan village on the 25th, the Japanese 23rd division was trapped. On 26 August, a Japanese attack to relieve the 23rd division failed. On 27 August, the 23rd attempted to break out of the encirclement, but failed. When the surrounded forces refused to surrender, Zhukov wiped them out with artillery and air attacks. The battle ended 31 August with the complete destruction of the Japanese forces. Remaining Japanese units retreated to east of Nomonhan. As Zhukov completed the annihilation of the 23rd division, great events were taking place thousands of kilometers to the west. The very next day, on September 1, 1939, Adolf Hitler launched his invasion of Poland and World War II broke out in Europe. The Soviets had already agreed to the Molotov-Ribbentrop Pact, which called for the Soviet Union to occupy eastern Poland and establish spheres of influence in Finland, Latvia, and Estonia. Perhaps as a result of Stalin's new commitments in Eastern Europe, the Soviets advanced no further than the border line they had claimed at the start of this battle. The Soviets and Japanese signed a cease-fire agreement on 15 September; it took effect the following day. Stalin, free of any worry from his eastern border, was free to give a green light to the Soviet invasion of Poland (1939) that began on 17 September. Casualty estimates vary widely: Some sources say the Japanese suffered 45,000 or more soldiers killed with Russian casualties of at least 17,000,. The Japanese officially reported 8,440 killed and 8,766 wounded, while the Russians initially claimed 9,284 total casualties. It is likely that figures published at the time were reduced for propaganda purposes. In recent years, with the opening of the Soviet archives, a more accurate assessment of Soviet casualties has emerged from the work of Grigoriy Krivosheev, citing 7,974 killed and 15,251 wounded. Similar research into Japanese casualties has yet to take place. Although this engagement is little-known in the West, it had profound implications on the conduct of World War II. It may be said to be the first decisive battle of World War II, because it determined that the two principal Axis Powers, Germany and Japan, would never geographically link up their areas of control through Russia. The defeat convinced the Imperial General Staff in Tokyo that the policy of the North Strike Group, favoured by the army, which wanted to seize Siberia as far as Lake Baikal for its resources, was untenable. Instead the South Strike Group, favored by the navy, which wanted to seize the resources of Southeast Asia, especially the petroleum and mineral-rich Dutch East Indies, gained the ascendancy, leading directly to the attack on Pearl Harbor two and a half years later in December 1941. The Japanese would never make an offensive movement towards Russia again. In 1941, the two countries signed agreements respecting the borders of Mongolia and Manchukuo and pledging neutrality towards each other. They remained at peace until the Soviet conquest of Manchuria in August 1945, in the final weeks of the war. Russian President Dmitry Medvedev and Mongolian President Tsakhiagiin Elbegdorj at a ceremony in Ulaanbaatar in August 2009, commemorating the 70th anniversary of the Battle. It was the first victory for the soon-to-be-famous Soviet general Georgy Zhukov, earning him the first of his four Hero of the Soviet Union awards. The other generals Grigoriy Shtern and Yakov Smushkevich whose roles were no less important earning them the hero title as well after the World War II were forgotten. Zhukov himself was promoted and transferred west to the Kiev district. The battle experience gained by Zhukov was put to good use in December 1941 at the Battle of Moscow. Zhukov was able to use this experience to launch the first successful Soviet counteroffensive against the German invasion of 1941. Many units of the Siberian and other trans-Ural armies were part of this attack, and the decision to move the divisions from Siberia was aided by the Soviet masterspy Richard Sorge in Tokyo, who was able to alert the Soviet government that the Japanese were looking south and were unlikely to launch another attack against Siberia in the immediate future. A year after flinging the Germans back from the capital, Zhukov planned and executed the Red Army's offensive at the Battle of Stalingrad, using a technique very similar to Khalkhin Gol, in which the Soviet forces held the enemy fixed in the center, built up a mass of force in the area undetected, and launched a pincer attack on the wings to trap the enemy army. A pincer attack as such is as old as Cannae, but Zhukov has considerable merit in knowing when to do it and especially how to get it done, on the massive thus logistically demanding scale in question. The Japanese, however, while learning never to attack the USSR again, made no major changes to their tactical doctrines. They continued to emphasize the bravery and courage of the individual soldier over massing force and armor. The problems that faced them at Khalkhin Gol, most importantly their lack of armor, would plague them again when the Americans and British recovered from their defeats of late 1941 and early 1942 and turned to the conquest of the Japanese Empire. At the International Military Tribunal for the Far East, fourteen Japanese were charged with having "initiated a war of aggression . . . against the Mongolian People's Republic in the area of the Khalkhin-Gol River" and also with having waged a war "in violation of international law" against the USSR. Kenji Doihara, Hiranuma Kiichirō, and Seishirō Itagaki were convicted on these charges. The Mongolian town of Choibalsan, in the Dornod aimag (province) where the battle was fought, is the location of the "G.K. Zhukov Museum", dedicated to Zhukov and the 1939 battle. Ulaanbaatar, Mongolia also has a "G.K. Zhukov Museum" with information about the battle of Khalkhin Gol. ^ a b "Grif sekretnosti sniat': poteri Vooruzhennykh Sil SSSR v voynakh, boevykh deystviyakh i voennykh konfliktakh", pod oshchey redaktsiey G. F. Krivosheeva. (Moskva: Voennoe izd-vo, 1993, ISBN 5203014000). pp. 77-85. ^ Glantz, David M.; and House, Jonathan. When Titans Clashed: How the Red Army Stopped Hitler. Lawrence, KS: UP of Kansas, 1995. ISBN 0700608990 p. 14. ^ Drea, Edward J. "Leavenworth Papers No. 2 Nomonhan: Japanese Soviet Tactical Combat, 1939 - MAPS" - Retrieved: May 13, 2007. ^ Baabar (1999), p. 384-6. ^ Drea, Edward J. "Leavenworth Papers No. 2 Nomonhan: Japanese Soviet Tactical Combat, 1939 - BIG MAPS - Map 3" - Retrieved: May 13, 2007. ^ Baabar (1999), p. 386-7. ^ a b c d e f g h Timothy Neeno, M.A. Nomonhan: The Second Russo-Japanese War, 2005. - Retrieved: May 12, 2007. ^ Drea, Edward J. "Leavenworth Papers No. 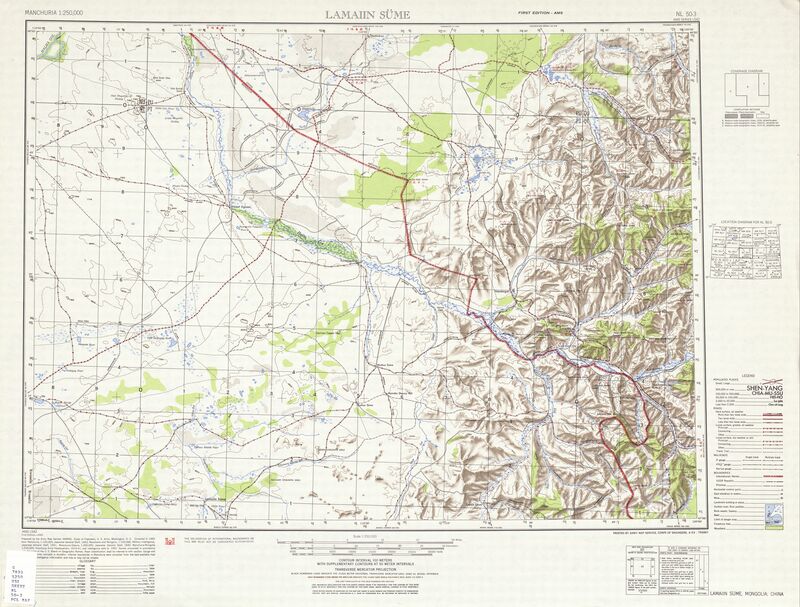 2 Nomonhan: Japanese Soviet Tactical Combat, 1939 - BIG MAPS - Map 4" - Retrieved: May 13, 2007. ^ Drea, Edward J. "Leavenworth Papers No. 2 Nomonhan: Japanese Soviet Tactical Combat, 1939 - BIG MAPS - Map 6" - Retrieved: May 13, 2007. ^ "Declaration Regarding Mongolia", April 14, 1941. - Retrieved: May 13, 2007. Chiyoko Sasaki: Der Nomonhan Konflikt: Das fernöstl. Vorspiel zum 2. Weltkrieg. Bonn University, 1968. Phil. F., Diss. 6. Nov. 1968. Drea, Edward: Nomonhan: Japanese-Soviet Tactical Combat, 1939. Leavenworth Papers study for the Combat Studies Institute of the U.S. Army. Drea, Edward J. (1998). "Tradition and Circumstances: The Imperial Japanese Army's Tactical Response to Khalkhin-Gol, 1939". In the Service of the Emperor: Essays on the Imperial Japanese Army. Nebraska: University of Nebraska Press. ISBN 0-8032-1708-0. Erickson, John: The Soviet High Command: A Military-Political History, 1918-1941. Routledge, 2001. ISBN 0-7146-5178-8. Onda Shigetaka: Ningen no kiroku: Nomonhan-sen (人間の記録　ノモンハン戦). Tokio: Gandaishi shuppan kai, Tokuma shoten, 1977. Neeno, Timothy: Nomonhan: The Second Russo-Japanese War. MilitaryHistoryOnline.com essay. Uses the Coox book and Drea paper as sources. Zaloga, Steven J. Japanese Tanks 1939-45. (2007) Osprey. ISBN 978-1-84603-091-8.